Mr Stevens said Digga's operators also appreciate the Toyota Forklifts because they're practical to use - with fantastic ergonomics and drivability. TMHA's Martin Gross (left) with Digga's Micah Stevens. The attachment manufacturer has a new fleet of eight Toyota 8FBE20 2-tonne 3-wheel forklifts (all electric) to keep the heart of its material handling operations pumping. With the exception of Victoria, former Taylor-Dunn retailers will no longer have rights to sell products such as its SC-100 Stockchaser (depicted). TMHA says its commitment to making the range of Taylor-Dunn products part of its national branch network will bring a great deal of confidence to existing and prospective customers in Australia. TMHA has been appointed as the exclusive distributor of all Taylor-Dunn products, such as the depicted Bigfoot electric utility vehicle, in Australia. 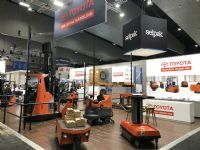 The 1.6-tonne capacity Toyota BT RAE160 reach forklift, featuring a 10-metre mast, is joined on the TMHA stand by a Taylor-Dunn stock-chaser and TMHA's latest-model ride-on and walkie-stacker forklifts, scrubber dryers and stock-pickers, for the expo's duration. 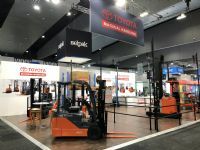 Toyota Material Handling Australia is for the first time publicly showcasing its autonomous (operator-less) Toyota BT RAE160 reach forklift (rear left) at Melbourne's Auspack expo. All SRT Logistics sites feature dedicated refrigerated warehouses with sealed loading docks. 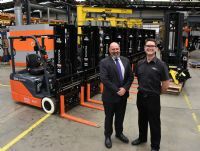 SRT Logistics CEO Rob Miller (left) with TMHA Hobart area sales manager, Rodney Jones, and the first of 36 new Toyota Material Handling forklifts and pallet jacks delivered across its Tasmanian food distribution operations. In a departure from its former leasing model, Mr Miller said SRT purchased the new equipment outright after considering a business case based on durability. TMHA is poised to open a new purpose-built branch in Adelaide that will feature a dedicated training facility and demonstration area, to serve the material handling and construction equipment needs of South Australian customers.